Initiated by property owners and managed by the North Park Main Street Board of Directors, the North Park Property and Business Improvement District (NPPBID) provides for special benefits, improvements and enhanced services within the PBID boundaries (see attached map). The NPPBID provides a variety of improvements such as streetscape, aesthetic appeal, advocacy, safety, cleanliness, economic development, sidewalk power washing, and increased amenities. All this is funded and directed by property owners. All committees meet at the North Park Main Street office located at 3939 Iowa St., Ste. 2, San Diego, CA 92104. The public is welcome and encouraged to attend! North Park Organization of Businesses, Inc. The Explore North Park marketing and outreach program instills a unique benefit to the visitors, businesses, and residents of North Park. Through various marketing assets, including a website, social media platforms, and print materials, the benefits of working in, and visiting North Park are broadcast far and wide. Not only are these assets gorgeous, they’re also highly trafficked and have demonstrated success in sharing our neighborhood’s strong character and message across the country. 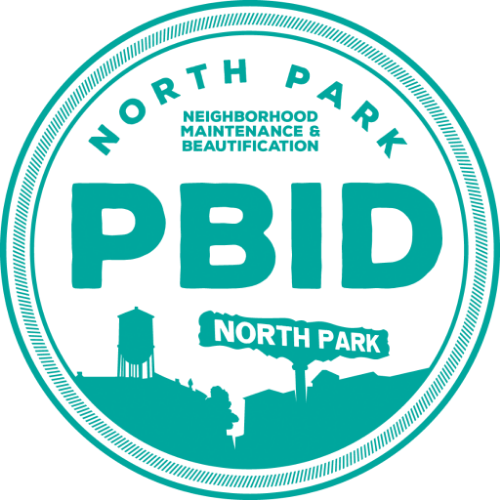 The NPPBID or “PBID”is responsible for providing improvements, maintenance, and activities which constitute and confer a special benefit to assessed parcels in North Park. In English, this means a special assessment is levied on property owners in North Park to fund the PBID, and in return the PBID, managed by North Park Main Street, provides sanitation, landscaping, improvements, and economic development services. The 2018 budget for the North Park PBID is $308,000. With this money our Board of Directors, an elected Board comprised of our North Park property and business owners, has identified several goals for our District. Activation and programming of the public space, outreach and engagement within the community, beautification and eliminating visual blight will be the focus of our plan. If you have ideas or want to help in these efforts, please join in on our committee meetings which are open to the public.